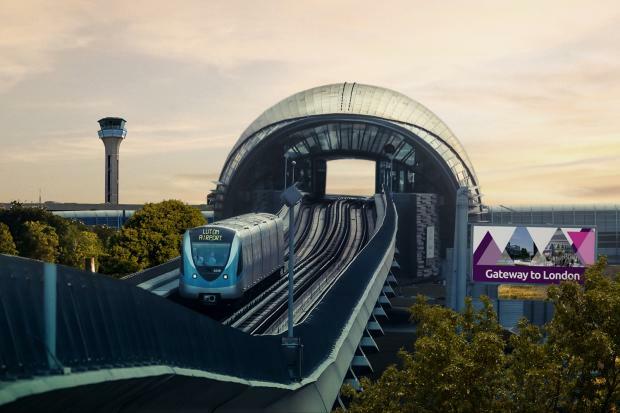 Luton Airport today promised passengers some of the fastest connections to and from central London as it announced plans for a £200 million Tube-style link. A light railway will connect the airport to Luton Airport Parkway train station, meaning transfers will take less than five minutes - enabling the journey to and from St Pancras to be completed in under 30 minutes. At present, passengers using the train station have to wait for an airport shuttle bus, which takes about 15 minutes. Airport bosses hope the new link will encourage passengers to use public transport rather than drive. The driverless trains will run 24 hours a day on new track separate from the road network, and will link with the airport car park. “It’s a significant undertaking,” said Luton Airport chief executive Nick Barton. “We have to build three stations, tunnels and bridges over a dual carriageway. The 1.4 mile MPT (mass passenger transit) link is being designed by Arup and due to be completed by the end of 2020. A planning application is expected to be submitted in the Autumn, with construction starting next year. It is envisaged that fares would be included as part of the train ticket or car parking fee, or available separately, as with the shuttle bus. It will further boost the airport’s attractiveness, adding to an ongoing £110 million redevelopment of the terminal and plans to introduce Oyster ticketing to Luton Airport Parkway by 2018. More than one million passengers used the airport last month, a new record. Numbers are up almost 25 per cent year-on-year. About a fifth of passengers use Luton for business flights, the remainder for leisure or visiting family. The number of airlines flying from Luton has increased from nine to 17 in the last two years. The airport is forecasting a 50 per cent increase in passengers, to 18 million, by 2020.